The IsatTruck instantly gives broadcasters the ability to access satellite communications anytime and anywhere, with no installation, and the ability to move from vehicle to vehicle and use the phone outside of the truck. GMPCS Personal Communications, a leading global supplier of satellite communications, today announced the availability of the IsatTruck™ satellite communications kit for journalists and other broadcast professionals who need affordable satellite communications for immediate deployment to outside broadcast locations. 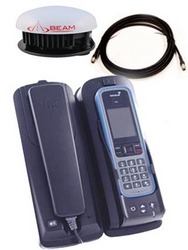 The kit pairs the Inmarsat IsatPhone Pro satellite phone and a docking station in a rugged portable case. Included cables allow an external antenna to mount to the top of a vehicle magnetically, and adapters for the vehicle power supply, allowing in-transit use. The IsatPhone Pro Handheld phone can be used independently of the kit when communications are needed away from the satellite truck. With the recently announced GMPCS Speedmail application for IsatPhone Pro data service, the IsatTruck also lets broadcasters send and receive files, emails and images with their laptop computer, in addition to offering clear and reliable voice service. GMPCS is a leading global satellite communications provider offering total communications solutions to customers including news gathering organizations, emergency response organizations, merchant shipping fleets, fishing companies, state and federal government organizations, energy exploration and production companies, enterprise businesses, airlines and more. GMPCS Personal Communications operates from a 15,000 square foot office and warehouse facility in Southern Florida, supplying equipment for Iridium, Inmarsat, Thuraya and Globalstar satellite service. GMPCS also has offices in Chicago and London, and maintains an extensive network of more than 200 distribution partners operating globally throughout the United States, Canada, Latin America, Europe and the Middle East.